At approximately 12:35 a.m. today, July 17, officers from the Noblesville Police Dept. were dispatched to the address of 516 S. Ninth St. after someone requested a welfare check on the residence. 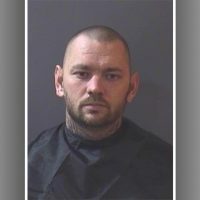 Once officers arrived, they reported that a person – identified as Dennis Wayne Toomey, Jr., 38, Noblesville – from inside the residence had pointed a firearm at them as they approached. Police say a perimeter around the scene was immediately set up, and members of the Noblesville/Westfield Police Dept. Emergency Services Unit were dispatched. More than three hours later, at approximately 4:10 a.m., crisis negotiators were able to successfully negotiate the surrender of Toomey, who was taken into custody. The suspect was transported to the Hamilton County Jail and booked at 6:53 a.m.